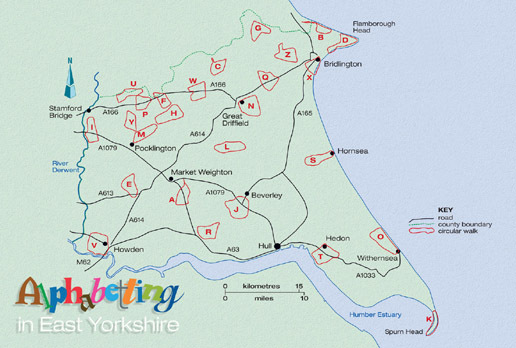 Alphabetting in East Yorkshire (published in 2010) is a collection of 26 circular walks. Each walk goes to a place or feature beginning with a different letter of the alphabet, so the ‘A‘ Walk goes to Arras, the ‘B‘ Walk to Bempton, the ‘C‘ Walk to Cowlam and so on. There are even walks to Q, U, V, X, Y and Z locations. All the walks are circular and are about 10 miles long but most have a shorter alternative of about 5 miles. Town Trails with photo Treasure Hunt clues are an additional feature of a number of the walks. Christian Aid has had a number of match-funding agreements with the European Union. The project currently being supported is one in Ethiopia, whereby, for every £1 raised by Christian Aid, the EU will match-fund with another £5. As all the proceeds from ‘Alphabetting in East Yorkshire’ are being given to this project, and the book costs £10.00, that means £60.00 will be given for Ethiopia, after the EU match-funding has been added. Remember, Christian Aid never gives to foreign governments; it works through trusted partners in the receiving countries.